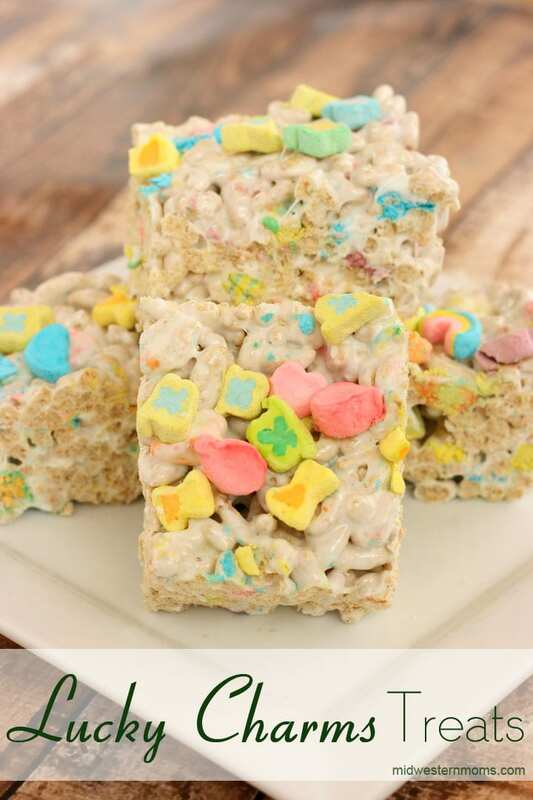 Lucky Charms Treats are an easy St. Patrick’s Day Treat to make. 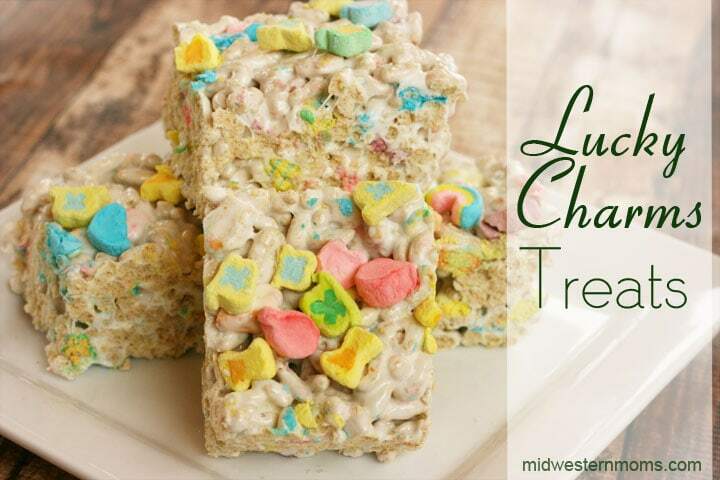 This is a modified Rice Krispie Treats recipe that incorporated Lucky Charms Cereal instead of Rice Krispies Cereal. This recipe is extremely easy to make and the kids can even help make these delicious treats. I placed the treats into an 8 x 8 pan so they did come out a bit thick. Just cut your treats a little smaller due to the thickness. I tried a 9 x 13 and there was not enough to cover the bottom of the pan. An easy treat that is perfect for St. Patrick’s Day! Lucky Charms treats are perfect for St. Patrick’s Day! Melt the butter in a large pan melt the butter on low heat. Add the bag of marshmallows. Stir until the marshmallows are melted. Remove from heat and stir in the Lucky Charms. Place the mixture into a greased 8×8 pan. Make sure to grease the spatula so the treats do not stick while you press them down into the pan. Let it cool for a bit before cutting into servings. OMWord!! I LOOOOOOVE Lucky Charms! I’d eat the whole box if I’d allow myself. These sound yummy!!! 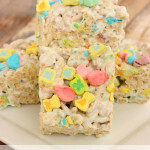 It does not matter how old I am, I still like those Lucky Charms, this looks like a great recipe, and I have pinned for later parties. Happy Wednesday, thanks for linking to The Oh My Heartsie Girls WW this week. Thank you for stopping by Karren! Adorable and festive! Thanks for sharing these treats at Foodie Friday. It never occurred to me to use a different ceeal for marshmallow treats. My kids love Lucky Charms. I’m sure they will love these! Thanks for linking it up at This Is How We Roll Thursday. We will really enjoy your Lucky Charms Treats, looks so good! Thanks so much for sharing this awesome recipe with Full Plate Thursday. Hope you have a great weekend and come back soon! How fun! My kids love rice crispies and this is a fun twist on a loved treat. Thanks for sharing on Merry Monday. Hope to see you again tonight at 6pm PST. Yum! I’m going to use food dye and dye them green to make them even more lucky!